It’s been a quite busy couple of weeks, and although I’ve been baking for two birthdays and the usual Monday scene, I’ve been too scatter-brained to take pictures, so we’re going to have to make do here. I’ll do a bit of a round-up of the baking, then offer what you’ll have to take on faith is quite a photogenic, in addition to easy and well-received, sangria. So first things first: His Lordship’s birthday came ’round again, and as usual there is no cake for you! because he turns up his nose at cake and demands pie instead. 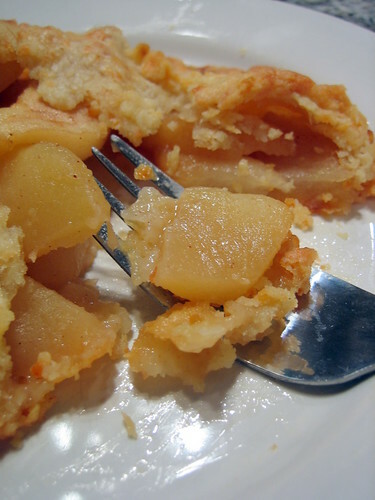 Since it’s prime apple and pear season, he usually gets some variation on one or the other, and this year, I found this perfect recipe by Tartelette at exactly the right time. 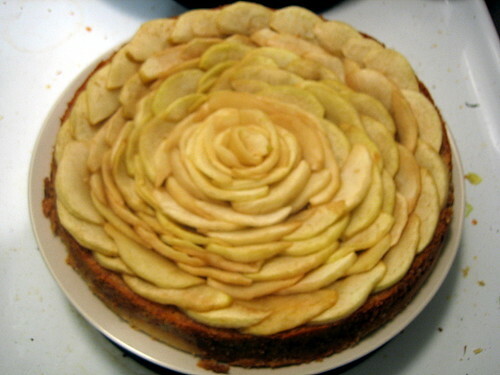 Since I don’t currently have tart molds, I made it as one big tart instead, with locally-grown Cameo and Pink Lady apples baked with maple syrup instead of honey. It was quite fabulous, especially the frangipane custard layer. 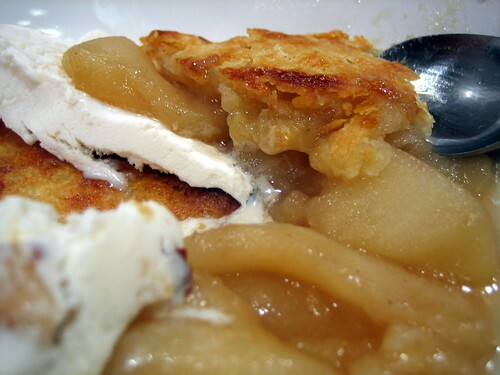 The one change I’d make next time is to slice the apples just a smidgen thicker for a more toothsome texture, even if they won’t layer as prettily as they did in the (sadly mediocre) picture above. For the other birthday person, who thankfully does not ‘meh’ cake and asked for anything chocolate, I made dark chocolate cupcakes from the same Scharffenberger base recipe behind my uber-coconutty German Chocolate Cupcakes. 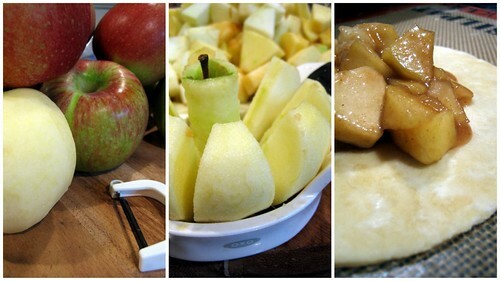 Combine everything in a large pitcher and refrigerate for at least an hour to let flavors combine. I used California pinot grigio here, but it’s a really flexible recipe and you could use whatever strikes your fancy, including swapping red or rose for white. I’d just add two cautions: don’t use chardonnay unless it’s aged in neutral barrels, because the oak will overwhelm the fruit, and don’t waste your best wine here. You actually want to use the cheap, unobtrusive stuff in sangria. 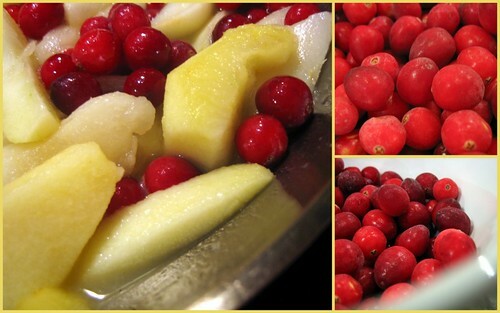 Despite my love of fall produce, especially cranberries, for some reason I’m not quite ready for autumn just yet. Ready or not, the temperatures are dropping, the rain and wind have definitely arrived, and so have the seasonal offerings at the market. Since I can’t hold it back, this rich, just barely gingery bisque of kabocha squash is a great start toward embracing the inevitable. I roasted the diced squash first for extra depth, and separately toasted the seeds with butter and five-spice powder for a crunchy garnish. 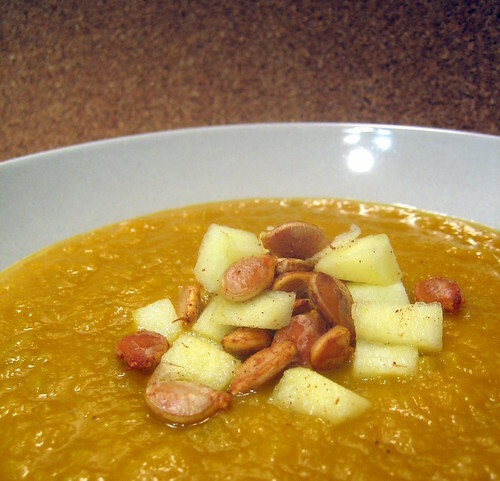 Apple cider mixed with the vegetable stock and diced apples in the garnish added a hint of sweetness and brought out even more of the squash flavor. Although it was the backbone of a very casual rainy-day dinner tonight, the smooth simplicity and seasonally-appropriate colors of this soup would make it a great first course for your Thanksgiving dinner. Preheat oven to 400 F. Line two baking sheets with foil. Peel and empty out the squash, reserving the seeds. Chop the peeled squash into 1-inch dice and toss with canola oil, then spread onto sheet in single layer. 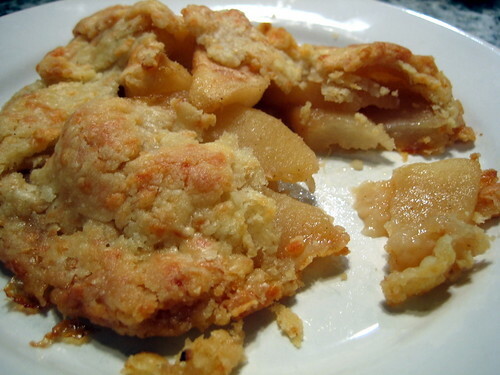 Bake until tender and beginning to brown at the edges, 30-35 minutes, stirring once or twice. Remove from oven and reduce oven temperature to 375 F.
Remove the seeds from the squash pulp, clean well in a bowl of water, and pat dry between paper towels. 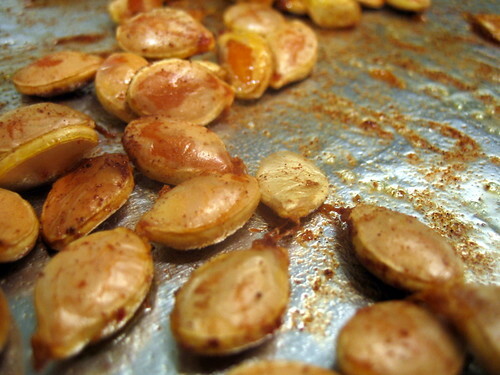 Stir the salt and five-spice powder into the melted butter, add to the cleaned seeds, and toss to combine. Spread onto the second sheet and roast until golden and crisp. Set aside to cool. Heat the butter and olive oil in a heavy stock pot over medium heat. Saute the onion and celery until translucent, then add roasted squash and ginger cook a few minutes more. Add stock, cider, salt and pepper. Bring to a boil, then cover and lower heat, simmering for 30 minutes. Using an immersion or regular blender, puree the soup until smooth. Taste and correct with additional salt and pepper as needed. Peel and dice the apple, tossing with the lemon juice, then mix with the roasted seeds. Ladle the soup into bowls and top with the seed and apple garnish. Any orange squash, from butternut to pumpkin, could be substituted here, although pumpkin seeds are tougher and more fibrous than kabocha. In that case, I would use toasted pecans in the garnish instead, as I did when I first made this soup with sweet potatoes, which was also great. I am woefully behind on the blogging, and I’m afraid I still don’t have the time or energy right now to do this anywhere near as well as I’d like to, but something is better than nothing, right? 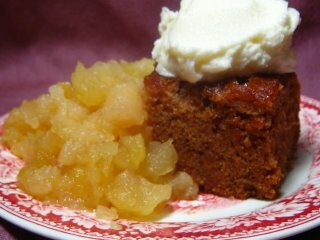 Anyway, in a (probably futile) attempt to catch up, here is the Sunday project from two weeks ago: Honey Gingerbread, served with a compote of apples and quinces and topped with a generous dollop of sweetened mascarpone. While I love ordinary gingerbread, using honey instead of molasses gentles the cake, letting the spices warm and soothe you instead of being overwhelming, and serving it with the sweet fruit and the creamy cheese turns a humble snack cake into an unpretentious but still elegant dessert that could unapologetically round out a fancy meal. Since the accompaniments are so simple (just add quinces to your favorite applesauce recipe, and stir a spoonful or two of sugar into a container of mascarpone), I will only give the recipe for the gingerbread. I will, however, encourage you to consider serving it with the garnishes, since the combination of textures and flavors is fabulous. If you don’t have access to quinces, you could use a combination of tart and sweet apples instead, but quinces add such a wonderful, exotic floral note to any fruit dessert that they are absolutely worth paying the extortionate prices whenever you can find them. Preheat the oven to 325 F. Grease a 13 x 9 x 2 inch baking pan and line with parchment paper. In a large bowl, whisk together the flour, spices and salt. 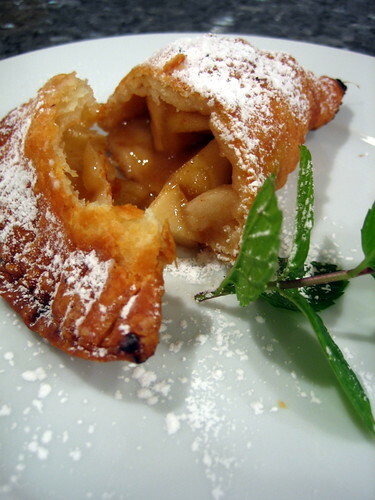 In a saucepan over medium-low heat, melt together the butter, sugar, and honey. Remove from the heat and allow to cool slightly, then mix in the milk, eggs and dissolved baking soda. Pour the liquid ingredients into the dry ingredients and mix well. 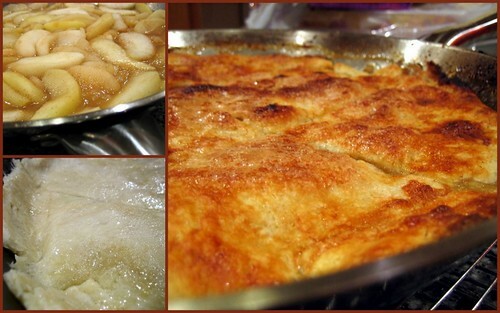 Pour into the pan and bake until firm but springy when touched, 45-60 minutes. 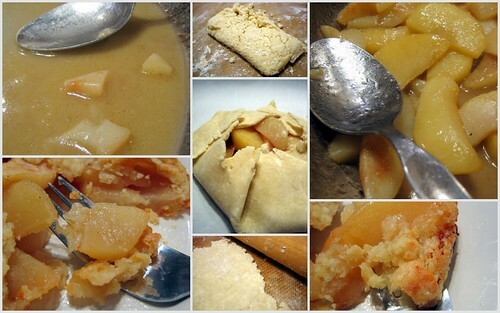 Remove from oven and allow to cool completely in the pan before cutting into squares. Notes: This gingerbread, like any gingery, cinnamony cake or cookie, will only improve if you give it a bit of time to sit. 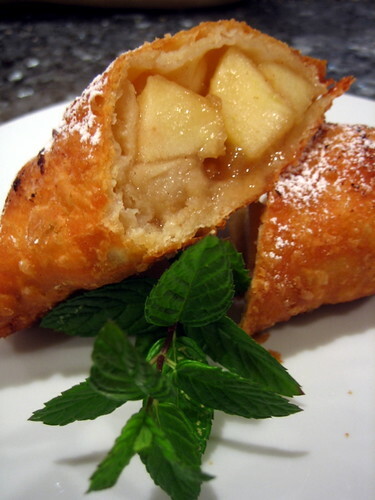 While it’s wonderful fresh from the oven, it will be even spicier and more flavorful for breakfast the next day.